Nice Studio condo recently renovated located in Sandpiper Cove. each sleep 2.) Full Kitchen with oven/refridgerator/built in microwave. Ground Floor unit is close to 1 of Sandpiper Cove's 5 swimming pools. Very short walk to Private Beach. Linens/dishes/utensils supplied. Also has a TV & VCR in unit. Housecleaning provided prior to checkin and upon checkout. Perfect for small families, couples and Groups of 4 or less! Similar to a roomy hotel suite with lots of resort amenities! I am a video producer from Atlanta,GA and live full time there. My wife, daughter and I love the Destin area and have been traveling there since my parents used to take me there starting in 1977. We purchased the studio condo in 2002 and soon after purchased a 1BR unit in the complex. We currently have both units and rent them out. The studio condo is perfect for an individual or a small group of 2-4 people who want to get to Destin on an affordable price. The condo does have a full kitchen and bath, so it is a property that can accommodate a small family for a beach vacation. 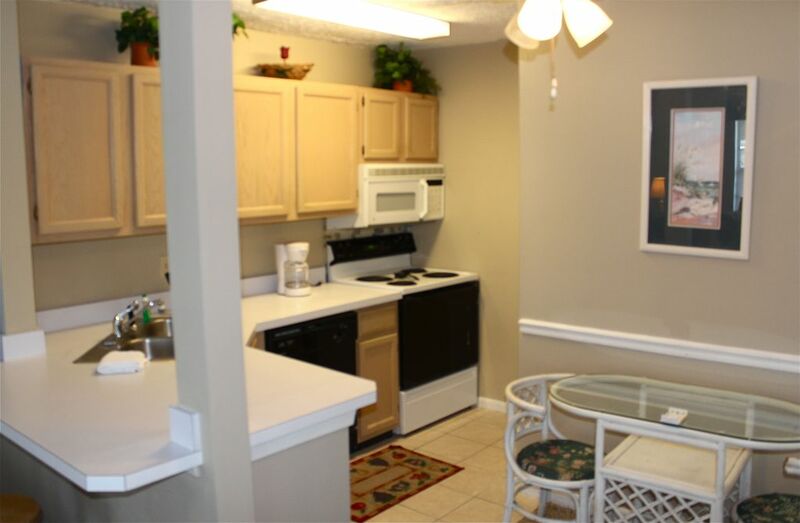 The unit is in a gated resort, so it's safe and is only about 100-125 yards from the beach. Bathroom is a full bath with tub and shower. Dinette table for 2 and a small island/bar with 2 barstools. Five swimming pools & suana in complex. Private beach with Pavillion & Snack Bar. Nine hole Par 3 Golf course located within complex is free to all renters. Six tennis courts. Shuffleboard court/Bocce court/Marina/dockfor fishing and boating/On site restaurant are all located on grounds. Destin has several attractions: water parks, amusement parks, new Harborwalk Village, movie theaters, Destin Commons shopping complex, grocery stores within 1 mile, a WALMART for last minute items, new Super Target across the street and several churches including Sunrise Services on the Beach! kayaking and snorkeling in beautiful waters of the Gulf of Mexico. just 5 minutes from condo.